In this higher reality, fear looks more like placing an eagle in a cage than dreading taxes. “I DON’T CARE what anyone thinks.” We lie. Physiologically, humans cannot separate physical threat from social threat. Our bodies see no difference between giving a speech and being attacked by a bear because throughout the course of evolution, isolation from the tribe resulted in death. Bear attack also resulted in death. Thus, your social lot was life or death. It may still be. Deny it intellectually, but as surely as the sunrise, you will become nervous before asking for a first date. Simply put, anytime the brain perceives potential social risk, fight-or-flight response will engage in the same way it would if you were robbed at gunpoint. Unless you fit into a small percentage of the human population with either sociopathy or psychopathy, fear is a reality to be sharpened by, not overcome via delusional triumphalism. So, next time you’re tempted to console yourself with a form of anti-social disorder, remember that dreading others’ disapproval remains one of the most usual instances of fright. Science doesn’t care what we think, and the test results are back: We do, in fact, care about the pack opinion. Regardless, there’s beauty to the claim of fearlessness — Nobility glinting through a fog. Is it possible to be indomitable? Biologically, it’s most likely impossible to be fearless. But what is being said by the unscared? The communication here is truer than mere word transfer — Heavier, poetic meaning is carried in these boasts. However, Laird is part of a larger family, a community of those who are unscared. One such member is Brian MacKenzie. Brian is a former ultra-marathoner and founder of both CrossFit Endurance and a holistic, lifestyle fitness system called XPT (founded with Laird), which was recently showcased by Outside TV. He trains professional athletes of various disciplines, Hollywood stars and military elite. He’s also a New York Times best-selling author. Brian has made a habit of slaying sacred cows since his genesis in the fitness community by flipping assumptive tradition on its head. He’s a revolution walking. MacKenzie uninvitedly reformed the nature of endurance sports for good when he crafted a novel training approach simply known as, “Power, Speed, Endurance”. The orthodoxy only a decade ago in regard to training for endurance events was infallible: LSD (Long, Slow Distance). LSD proposed that if you wanted to run a marathon, start running a lot because a marathon is long. This form of endurance training held a lengthy monopoly on the market, until MacKenzie began to experiment with his clients at CrossFit Endurance by utilizing deadlifts, squats, and only a fraction of the running volume — “Foolishness,” said the critics. He started trading intensity for time, exchanging skill for drudgery. The only thing crazier than his process was what resulted from it: His athletes were faster than ever. 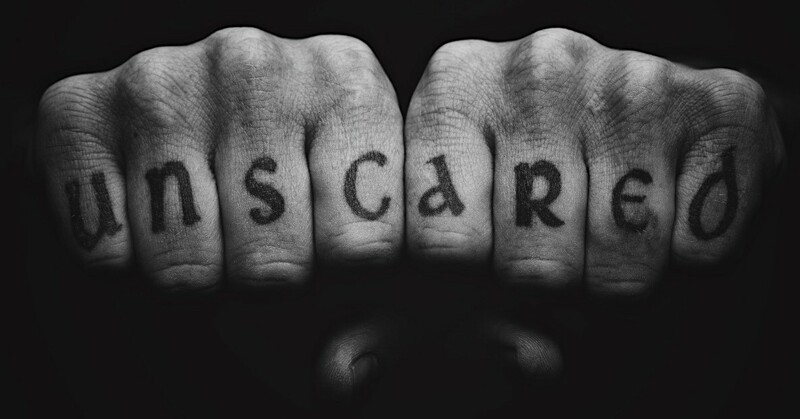 On MacKenzie’s knuckles is tattooed, “UNSCARED”. Here are individuals who surf death and have “unscared” inked into their hands. Meanwhile, they claim to be more afraid than you. The tension between these opposing demeanors is undeniable yet irresistible — Too powerful to be a mere play on words. So, how is this anomaly to be understood? Fear is necessary for life. Without it, we would die quickly. Being unscared then, is learning to reorient fear. Because our natural, entropic psychology is to fear Sally’s opinion from junior-high. Human default is to tremble in the wake of getting only 37 likes on your latest Instagram post. If this primal impulse is harnessed like the stallion it is, and missing what you were born for begins to horrify you more than looking uncool or scraping your knee — You will stumble into the realm of the fearless. Here are creatures who pick up a spoon and deliberately eat fear, digesting it daily. In this higher reality, fear looks more like placing an eagle in a cage than dreading taxes. “Who was I created to be, and why am I doing what I do?” It echoes within fearless folk. It echoes in you. The Unscared know they can do it even when they don’t think they can. Because courage is terror embraced. Do you see a tiny figure in the middle of that enormous, crashing wave? If you look closely, you’ll see the surfing speck is just a person who’s afraid.